Wow this pizza looks incredible! I’ve never had vegan pizza before and it looks soo good! 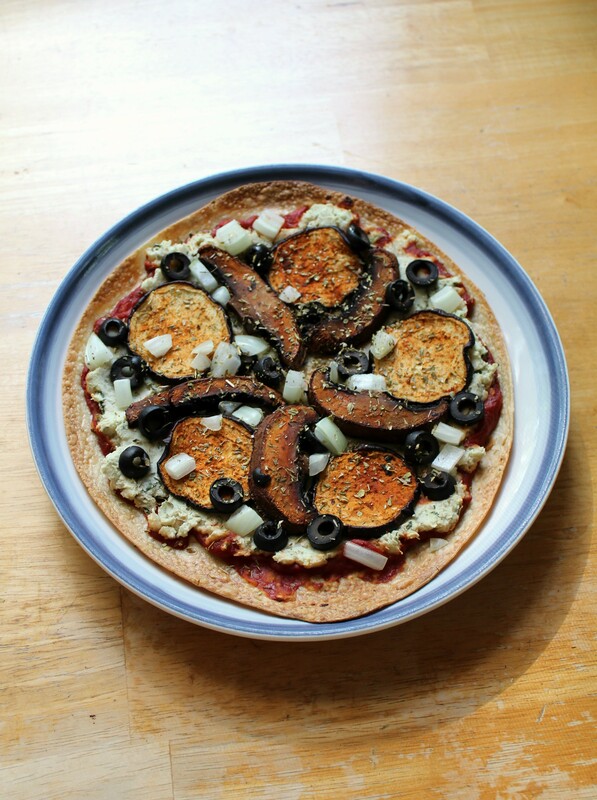 Haha, it’s not to hard to make vegan pizzas! You get to be fun and creative! Yum!! 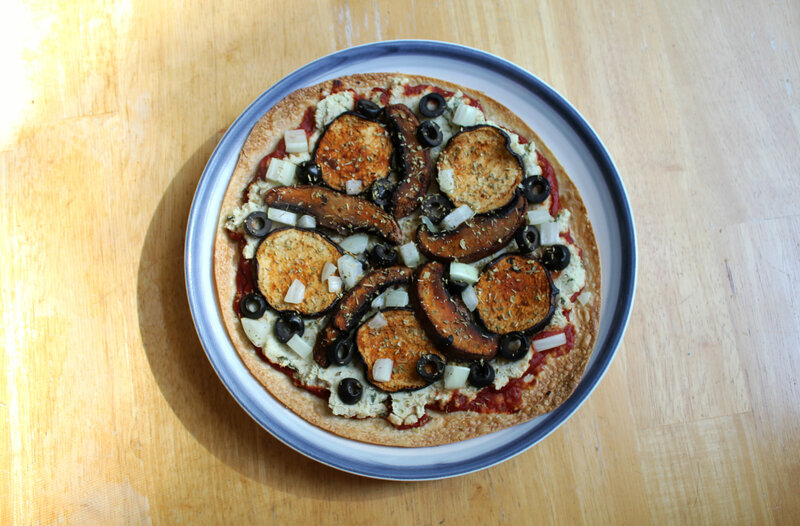 I’m always looking for more creative ways to make vegan pizza. This looks delicious!! I’ve never had beans on or in my pizza before, but I’d totally give this a try! I don’t get too crazy with my pizza choices–mushrooms and onions are about as wild as I go, but I did have a garlic aioli on a pizza one time that was delicious! Yum that looks great. Thanks for sharing! I (weirdly?) LOVE white beans. Awesome idea to add them to pizza for some extra protein! White beans are the bomb! Ok, first- have you ever tried Sonic Ice? I don’t know if you have Sonic where you are, but I used to buy huge cups of ice to munch on from there! (I was severely anemic so seriously went through way more ice than you would think is humanly possible!!) 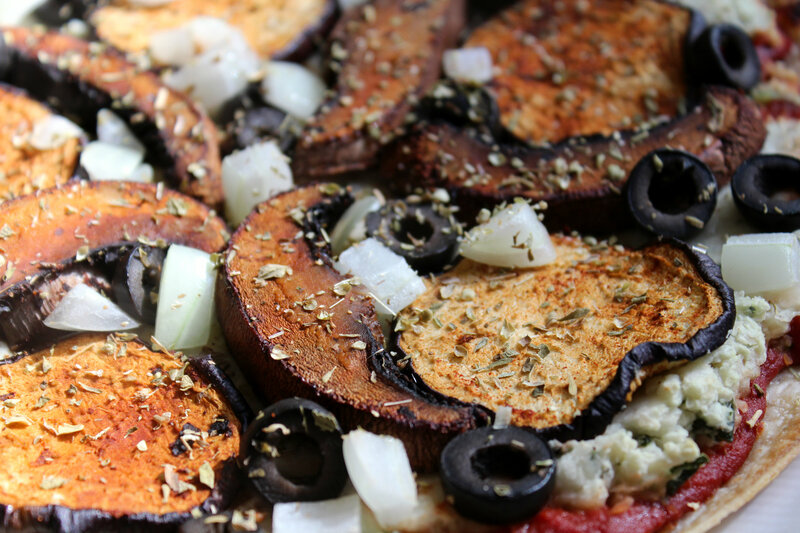 Second, OMG that pizza- and I have everything to make it (minus the eggplant, but extra mushrooms I think would be fine 😉 )!! Thanks for sharing! Pinning this one! Hahaha, no I have never 😛 But munching on ice will never get old! Woohoo! This one is super good! But really….when is pizza not good! I’ve never thought to add beans to a pizza. Yum! I’m so making this one! I love adding “hummus” bases to my pizzas! So hearty and healthy! I think making your own trumps it all no matter what, haha! So no worries here! YUM!!! Thank you for sharing at REAL Food Friday! You’ve been featured today at Mary’s Kitchen. Looking forward to seeing what you share this week. You always make the most interesting things! This looks yum. I love this idea! Thanks for sharing it at Savoring Saturdays, Rebecca! 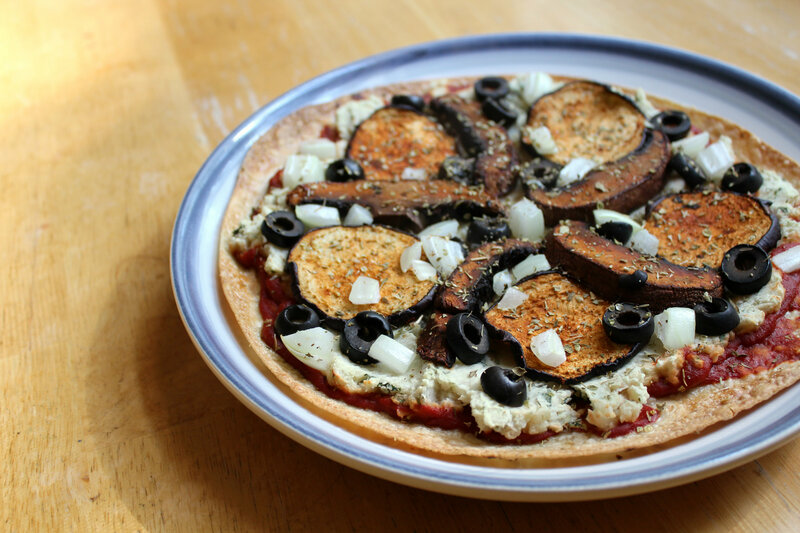 I am crazy about vegan pizza and love trying new combinations, so your Vegan Pepperoni White Bean Pizza really tickled my fancy. Each mouthwatering photo made me hungrier for pizza “now” so I can’t wait to try your fun and fabulous recipe. 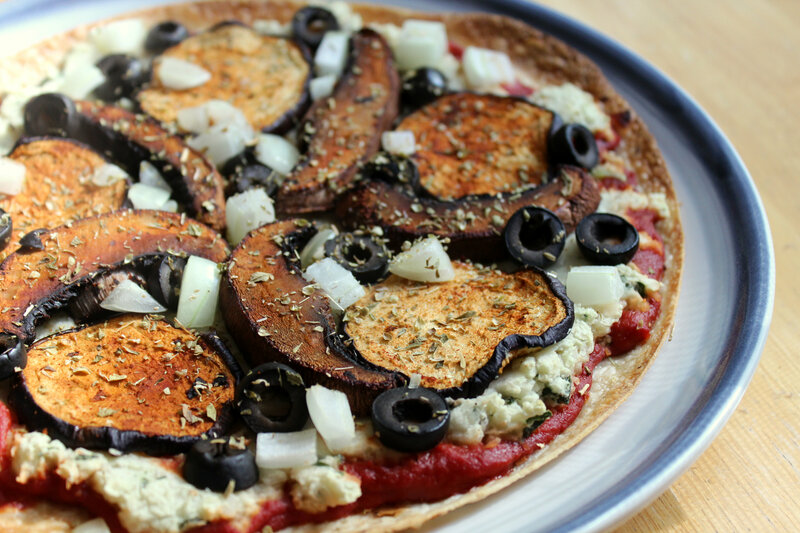 I am so glad you shared this healthy and delicious vegan pizza recipe at the Plant-Based Potluck Party Blog Hop! I appreciate it! The pepperoni idea is so cool!!! I’ve used ‘shrooms to make jerky before… this is even better! G’day! Looks great! Viewing as part of the The Weekend Retreat Link Party #71! Happy Friday, love! Congrats on your graduation! This looks amazing…making this soon! Mhmmm sounds really tasty!! I’ve never been a fan of mushrooms :(( I have tried and tried, but I just can’t swing it. If there are some in a meal I don’t pick them out though…I will eat them. I just prefer to order it without if I can! I’m also happy to have seen the chicken meatball pizza at the end of this! I don’t know how I missed that one! Its okay, you either love them or hate them and in my case, utterly hate them and randomly shift a fall in love suddenly! This looks absolutely DELICIOUS!!! I am definitely not a traditional pizza toppings lover, and ever since my celiac diagnosis, I’ve been diving into the veggies! Right now, I like topping my pizza (Red Mill’s crust is my fave!) with a little tomato sauce and monzarella and tons of broccoli, cauliflower, squash, zuchinni, pepperoni, and olives. 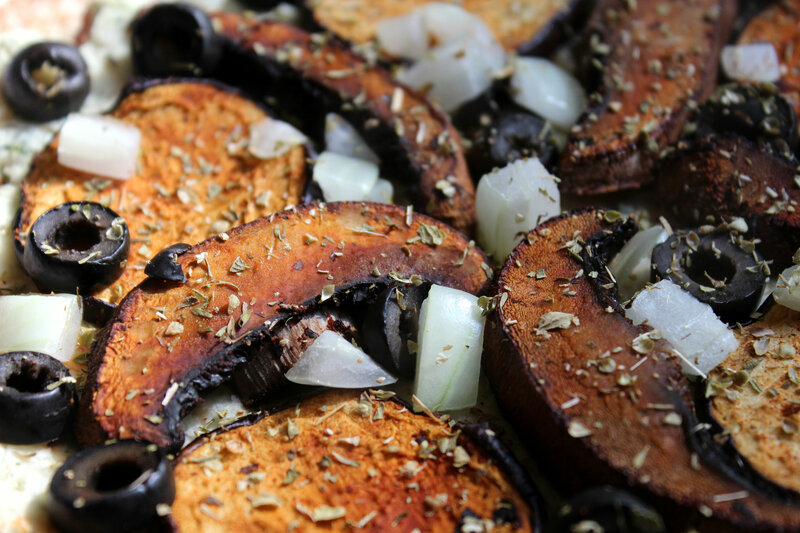 I’ve never tried eggplant, but it looks absolutely delicious! Thanks for the idea! And does the rice tortilla really work well as a pizza crust? The Tortilla is the best! It tastes so good baked a little in the oven, I am obsessed! The other day I even just warmed a tortilla with some tomato paste, sans toppings, in the oven because I think it tastes so good, haha! Your pizza looks great! I’m probably the only vegan on the planet who doesn’t like mushrooms… but I can definitely substitute with something else. By the way, I LOVE trips to the hotel ice machines, too! Ha! I used to hate mushrooms too! I only became obsessed with them a year ago 😉 You can just use more eggplant! Omg I’m gonna go make that right now. Ooh you are talking my language! Pretty sure I love all the different kinds of pizza that you mentioned 🙂 Eggplant one pizza is one of my favorite things ever! And such a great idea to use white bean spread, too (flavor + protein!)! I always need my good dose of protein at dinner! So when I keep things vegan, beans are a must! I’m not even a vegan and this looks really good. I will admit though I don’t keep a lot of these ingredients in the house- good way to get out of my comfort zone! Yes! This is a pizza for everyone 😉 Go out there and try it out, you won’t regret it! White bean huh? Sounds delicious, what a lovely change to tomato sauce! Weirdest pizza I ever had was pear and gorgonzola cheese with balsamic vinegar….but it was goooood! Ah a fancy pizza! Fruit and balsamic are always a good flavor match! I’ve never seen a pizza quite like this one, but I applaud you for making it sound awesome! I don’t usually add liquid smoke to pizzas, so that seems like a fabulous addition. I had to laugh about the crushed ice.. because theres this pizza place near my childhood home that has some awesomeeee crushed ice & their pizza is just so-so (at least for me).